"A stylish young couple on Sunset Boulevard pass the time in conversation whilst the service engineers examine their car in 1930s Los Angeles. This painting is a real blend of fact and fiction, so though based on historical fact it also includes a fair amount of artistic license! 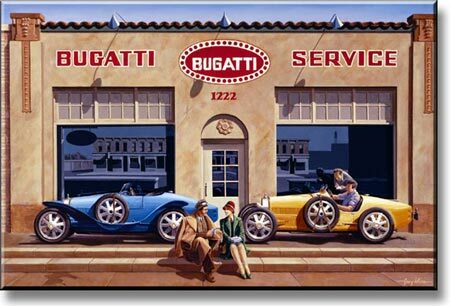 I love the symmetry of the building and from my research at the Bugatti Trust in England I know that it did once exist. However, I discovered on a trip to Los Angeles that sadly, it has not survived and I therefore felt all the more pleased that I had been inspired to record it in this painting."